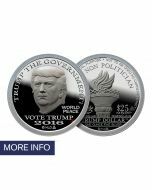 A special “Limited Edition” First Day of Issue of the 2017 Inaugural Trump Dollar will be issued on January 20th to commemorate the inauguration of Donald J. Trump – the 45th President of the United States of America! 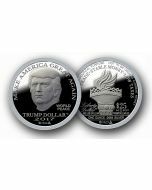 Every First Day of Issue (FDI) for the Inaugural Trump Dollar will be personally hand stamped with a special hallmark on a Brilliant Uncirculated Silver Inaugural Trump Dollar by Bernard von NotHaus - the monetary architect who designed the Trump Dollar. 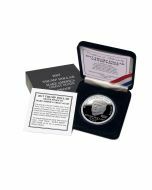 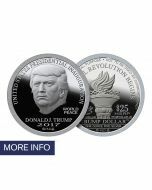 The First Day of Issue of the 2017 Silver Inaugural Trump Dollar was available at the special pre-issue price of only $35. 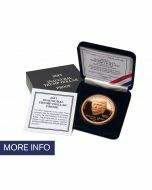 This limited release is now $45 and includes a Certificate of Authenticity and envelope. 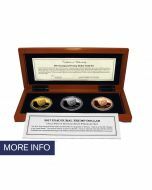 Order your special FDI today for only $45 each.